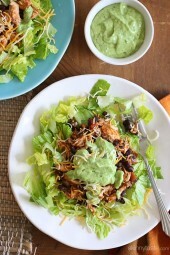 This simple slow cooker chicken taco salad is so delicious and it’s packed with fiber and protein which means it’s very satisfying, all for under 300 calories. Trust me, you won’t miss the tortillas! 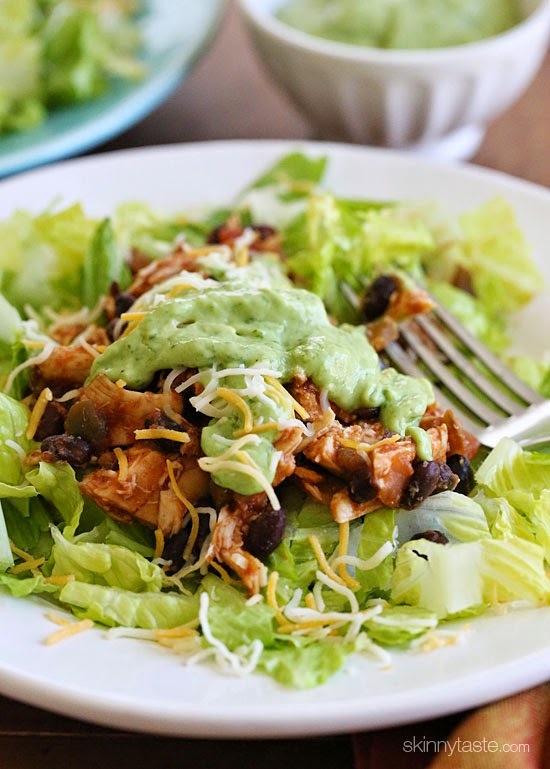 Taco salads are my favorite when I am craving a big hearty salad. If you want to turn this into tacos, just reduce the lettuce, omit the dressing and heat up some tortillas! 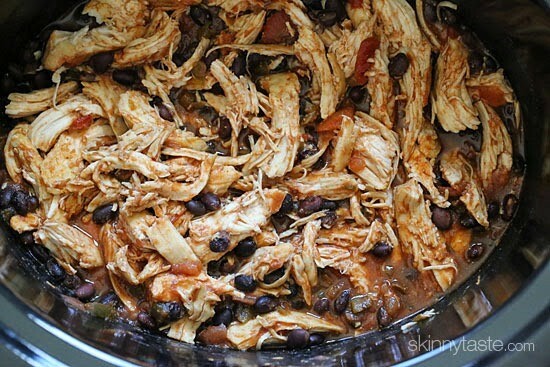 To make this easy dish, I basically added chicken breasts and black beans to the slow cooker, seasoning it with taco seasonings and topped it with salsa. Doesn’t get easier than that! A few hours later I shredded the chicken and combined everything for this wonderful topping to this salad. I also whipped up some of my favorite zesty avocado cilantro buttermilk dressing for the perfect salad that’s so satisfying and super easy to make. Try this for taco Tuesday! And since so many are asking, I have the 6 Quart Hamilton Beach Set ‘n Forget Programmable Slow Cooker (affil link). Although I love my Instant Pot, I still use my slow cooker all the time! I love it because you can adjust the time you want it to cook, and it automatically turns to warm when it’s done. It also has a probe for meat that automatically shuts off when done. I hated my old crock pot, it burnt everything and my food had a weird taste. This crock pot is so great, I actually own two! 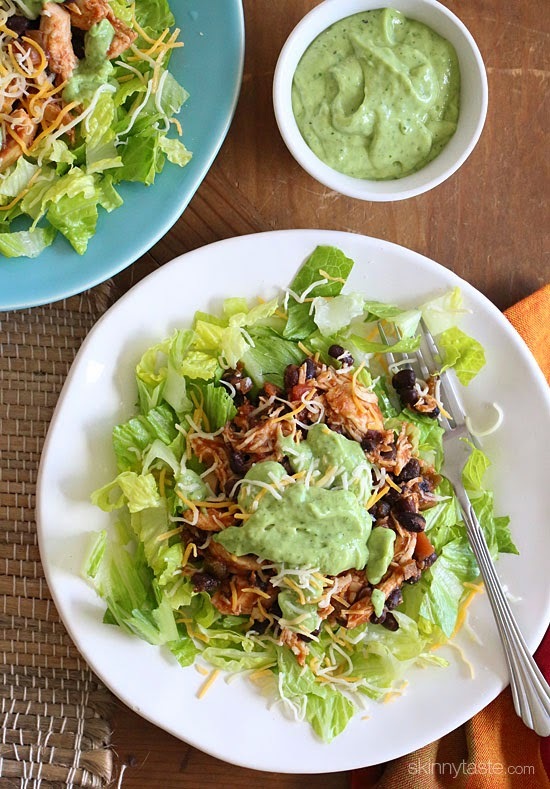 This simple slow cooker chicken taco salad is high in fiber and protein which means it’s very satisfying – all for under 300 calories. Trust me, you won’t miss the tortillas! Place the chicken in the slow cooker and season with taco seasoning and cumin. Pour the beans over the chicken and top with salsa. Cover and cook on LOW for 4 hours, or until the chicken is tender and easily shreds with 2 forks. 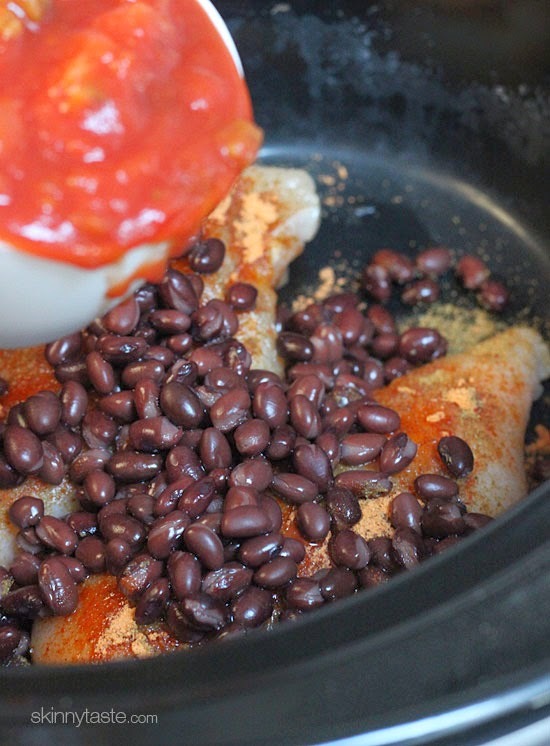 Shred the chicken and combine with the beans and sauce, keep warm until ready to eat. Makes 3 1/2 cups. 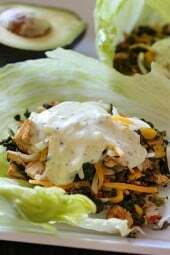 To make the salad, place 1 1/2 cups lettuce on each plate, top with 3/4 cup chicken and bean mixture, 1 tbsp cheese and 2 tablespoons zesty avocado buttermilk dressing. Do you have directions how to do this in a pressure cooker? This was so good and incredibly easy. With slow cooker liner clean up was a breeze. Can this be done in the instapot? Thank you for this fabulous recipe. Just started my Skinnytaste diet and am using your meal planner. So glad to start off with such an EASY recipe that my family loved. Was just going to cheat and buy cilantro dressing but I am so glad I took the time to make your Avocado Cilantro dressing. My kids had their chicken mixture in a burrito with the dressing. They loved it….my oldest had two! She said it was better than eating at El Pollo Loco, which is quite the compliment. Easy+delicious+little clean up = happy mom on a diet (AKA lifestyle change). I made this but wondering how the freestyle points would be 6? I skipped the cheese and used chopped plum tomatoes and green onions vs salsa. My recipe builder came out to 1 point per serving. Only factors were 2tbsp equivalent of dressing so 3/8 of avocado and 4 1/2 tbsp buttermilk for the 8 tbsp of dressing for the whole 4 servings. I was totally wondering this too. Does the 6sp include the dressing & cheese? I have different cheese, so I added that & the dressing separately. When I put this recipe in (as is) I also got 1sp per serving. P.S. I’m SOO obsessed with your meal plans!!! Thank you soooo much for doing them!!! Made this for dinner tonight! Absolutely delicious. My family (except for me) thought the dressing was too spicy with only 1 Jalapeno with no seeds added to the dressing. Oh well, more for me! You can use your oven if you don’t gave a crock pot… Preheat it to 400, place your ingredients into a casserole dish, cover tightly. Place the dish in the oven, turn it down to 200… 4 hrs it should be done. Always check the temp with a meat thermometer, aiming for 160-170 internal temp. I did this one with Skinny taste salsa verde and navy beans, we loved it, so easy and better then any restaurant. So that version works as well. Wonderful Thank you. That sounds wonderful! A great idea that I will try. Thank you. Temp your chicken so you don’t over cook and dry out chicken. Made this with the dressing recipe you attached. Both together and this is the BOMB. I didn’t make the topping but followed the rest of the recipe and it is sooooo delicious. Make it, you won’t regret it. SO SO SOOOOOO GOOD! Very filling! Easy to make! Delicious and highly recommend!!! This looks delicious. Will def be trying it soon! One question, how many calories do you count per ounce of boneless skinless chicken breast? I read somewhere to count 30 calories per ounce, so a 4 ounce serving would be around 120 calories. Is that correct? Should say on the package, yes usually 120 calories per 4 oz. I only have frozen chicken and want to make this tonight. Will it be okay in the slow cooker? Yes, I would add one more hour to be sure the chicken is fully cooked. Amazing, def one of my favs!!!! Prepped th night before for lunch and was perfect!! Generally have a hard time with warmed up chicken but you can’t tell it was warmed up at all!! This was delicious! Do you know if the cook time would change if I tried to scale it up to feed more people? Cook time should be the same. It turned out great! I added some corn and used Rotel for the salsa part. I don’t have a slow cooker so I used my rice cooker and it worked! I put the rice cooker on the cooking mode for 30 mins to get the temperature high, and then changed it to the keep warm setting for another 3.5 hours without opening the lid. The chicken turned out very mushy just as desired. If you use a rice cooker and are worried about the chicken not cooked through, you can cook it some more in the microwave afterwards. This dish was incredibly delicious! I used a very spicy salsa and a large jalapeño with some of the seeds left in. I subbed parsley for the cilantro. It was so nice to come home to a meal that is filling but healthy. Thank you, Gina! I loved this, esp the dressing! I did the recipe builder though and I got the 2 points for the dressing (soooooo good! ), but only 1 point for the chicken and bean part. I’m still new to WW, so I may be doing it incorrectly. I still did the quick calculator to keep myself honest. I have loved this week’s meal plan. Thank you! Gina love the recipe especially the dressing! Was wondering how the calculation of 6 freestyle points was calculated? Most ingredients in the recipe are free except cheese which was only 1 tablespoon of reduced fat cheese for 1 point and 2 tablespoon of the dressing which is 2 points per 3 1/2 tablespoons. So, is it 6 freestyle points for the entire recipe? Love this!! So simply and easy. Delish! The salad dressing was a little bland for my tastebuds, easy fix though. Add more garlic, salt, lime and jalapeno. 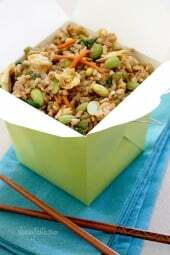 Loved it, easy to make and great for leftovers. Thanks for the recipe. This was soooo good! I was nervous it might be too spicy for my 3 1/2 yr old, but she devoured it! I’m trying to hold back from getting seconds. Thank you for easy and delicious recipes! For anyone who does Weight Watchers….this is a very WW friendly recipe! I top it with some nonfat plain Greek yogurt. SO easy and very, very tasty! My girls and I love this recipe! Wondering, though, if it could be made with pork instead of chicken. My husband doesn’t eat any fowl (and, no, that doesn’t make meal planning AT ALL difficult…LOL). Would the timing change at all? Don’t know if pork cooks in the slow cooker in the same time frame as chicken. Rated a 5 star winner, winner chicken dinner by my boys! So good with the dressing! And, so easy! what other kind of dressing can you use I am not a big fan of avocado? Is there a way to make this chicken and bean recipe in the instant pot??!! Sure, make sure you have 1 cup liquid and cook high pressure 20 min. This is absolutely DELICIOUS for a weekday lunch. My favorite desk salad topping! I use bottled Bolthouse cilantro yogurt dressing and top it with this heated-up. Hi Gina! I love your recipes!! I’m making this for lunches for the upcoming week. Do you know what this salad (with cheese and dressing) would be with the new freestyle points? I was thinking 3 for the dressing and cheese but wanted to check with you too. Thanks. All recipes now reflect the new freestyle points so 6 is the correct points. Hi! I’ve made this so many times and it’s one of my favorites! I’m going to make it for a bigger group soon. If I’m doubling the recipe do I still only need to cook on low for 4 hours? Thanks! If I’m doubling the recipe do I still only cook on low for 4 hours? Thanks! What kind of chunky salsa was used for this recipe? Brand? Homemade? I made this last night and my husband said it was the second best recipe of yours that we’ve ever tried! And we have tried at least 50 over the past year. 🙂 His first favorite was the chicken fajita pasta. So, we definitely hope you continue to post Mexican inspired dishes! I added frozen sweet corn to this and put it in my instant pot. Turned out amazing. Served it in mini tortilla bowls and my Smalls were thrilled. They even liked the dressing (minus the jalapeño). Thanks Sandy! Glad everyone enjoyed it! Can you share the settings/time you used in the Instant Pot? I did this in the instant pot tonight and it was wonderful! I did the exact same instructions: chicken breast, seasoning, salsa, beans. Did the high pressure cooker setting in the instant pot for 25 minutes, released the pressure, then shredded the chicken. I added some frozen corn here, stirred up and finished off for 10 minutes on the slow cooker setting. Was perfect!! How long did you cook it in the instant pot? How could you make this vegetarian? tempeh? Do you think this could be done in the pressure cooker? I don’t know if the liquid from the beans and the salsa would be enough liquid. This was easy and delicious! Made as directed, except used homemade taco seasoning (1/2 tsp each of cumin, chipotle chili powder, and Italian herbs). Had with soft tortillas, avocado and cheese for taco night, then will have leftovers for lunch on salads. Definitely adding this one to the regular recipe rotation! Ha! I was checking the comments for a homemade taco seasoning..thanks Laura! This looks amazing! 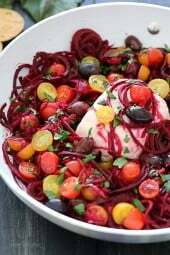 I love how flavorful and nutritious your recipes are, without being too expensive or time-consuming to make. And your instructions are always so easy to follow 🙂 Any chance you know the nutrition facts for the 3/4 cup of chicken and bean mixture on its own, without the salad ingredients? I’m thinking of mix & matching this a bit. Thank you!! Thank you. Sorry though, I don’t have that information. For the easy crock pot taco salad, does the smart points include the salad part with cheese and zesty avacado dressing? This looks yummy! Do you know what the smart points would be without the dresseng?